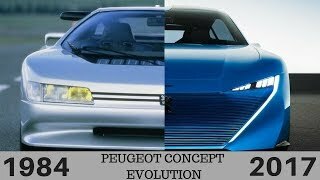 The 5 Peugeot concept car is another indication of the changing face of Peugeot and provides an insight into the Marque’s future ambitions in the large luxury vehicle segment. Its pure and elegant lines blend with subtle technical detailing to create an overall effect of a timeless, exclusive and modern design. 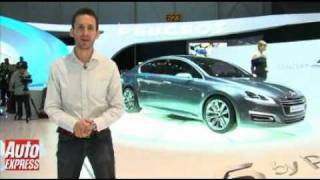 The “5 BY PEUGEOT” concept incorporates Peugeot’s HYbrid4 technology which, will be launched in 2011 in the Peugeot 3008. A 2.0 litre HDi FAP163 bhp diesel engine, mounted at the front of the vehicle, is combined with a 37 bhp electric motor at the rear. This arrangement provides an overall maximum power of 200 bhp, an electric only mode for low speed operation, four-wheel drive when required, and low fuel consumption and emissions of 74.3 mpg and 99 g/km of CO2 or zero in electric mode. 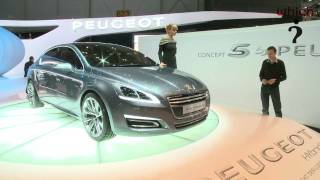 The “5 by Peugeot” concept car is another indication of the changing face of Peugeot and provides an insight into the Marque’s future ambitions in the large luxury vehicle segment. Its pure and elegant lines blend with subtle technical detailing to create an overall effect of a timeless, exclusive and modern design. Powered by Peugeot’s HYbrid4 technology, it ensures both high levels of driving enjoyment and environmental protection - 200 bhp, four-wheel drive and CO2 emissions of 99 g/km or zero in electric mode. Its dimensions, proportions and styling are a direct response to the changing trends in the large luxury saloon car market segment. It reflects the continual search for more status, quality and performance, combined with a modernity that encompasses the vehicle’s general efficiency in terms of architecture, engines and styling. “5 BY PEUGEOT” expresses the Marque’s vision and experience in the large touring car market. This concept car is designed and built to have both elegance and precision, but without in any way sacrificing the personality and dynamism so beloved of the Peugeot Marque. The emotion aroused by its exterior design holds the promise of exceptional interior space, convenience and comfort. The contours of the exterior body flow smoothly, unruffled and without interruption or embellishment from the end of the bonnet to the top of the boot lid. All surfaces are perfectly aligned, with clearances between each element precisely determined to obtain a quality of assembly rivalling that of a goldsmith. The overall effect it creates is that of a vehicle that has been hewn from a solid block of material. At the front, the interpretation of the Marque’s traditional feline appearance is spectacular; “LED” lights are highlighted by the use of illuminated surrounds that blend perfectly with the overall exterior body styling. The headlamps frame a unique front grille design, whose visual appearance is closely influenced by the Peugeot SR1 concept car. The innovative design of the front grille gives the impression that it is detached from the vehicle; it appears to be suspended in front of the car. The new revised Lion badge naturally takes pride of place in a specially shaped area at the front of the long aluminium bonnet. The streamlined sides of the car are enhanced further by the bevelled, brushed-aluminium window surrounds and door handles, combined with sculpted 19’’ wheel trims. The rear design of the vehicle suggests both robustness and power. The bold design of rear lights, consisting of three separate linked light clusters, clearly distinguish the vehicle at night, but also provides a link back to some of the Marque’s historic models. The elegance, precision and dynamic appearance of the car’s exterior styling is also reflected in the car’s technical specification. 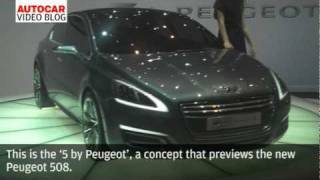 The “5 BY PEUGEOT” concept incorporates Peugeot’s HYbrid4 technology which, will be launched in 2011 in the Peugeot 3008. A 2.0 litre HDi FAP163 bhp diesel engine, mounted at the front of the vehicle, is combined with a 37 bhp electric motor at the rear. This arrangement provides an overall maximum power of 200 bhp, an electric only mode for low speed operation, four-wheel drive when required, and low fuel consumption and emissions of 74.3 mpg and 99 g/km of CO2 or zero in electric mode. “5 BY PEUGEOT” is further proof of Peugeot’s environmental strategy. The modular technology of the Hybrid4 system can be combined with a range of naturally-aspirated engines according to market requirements, and can be fitted to different body shapes and different platforms, helping to ensure future driving enjoyment.